Following a meeting of the Diocesan Committee of Patronage in the United Dioceses of Cork, Cloyne and Ross, the Bishop, Dr Paul Colton, is pleased to announce the appointment of the Reverend Paul Arbuthnot as Incumbent of Cobh and Glanmire Union of Parishes in the Diocese. The Reverend Paul Arbuthnot was born in Northern Ireland in 1981, attended Downshire School, Carrickfergus and Belfast Royal Academy. He studied history at Trinity College Dublin where he was awarded first a Bachelor in Arts degree, followed by a Master in Arts and a Master in Letters (M.Litt.). He was awarded his Bachelor in Theology degree in 2010 and was ordained deacon that year and priest the following year. During his time at TCD he was a lay vicar and choral scholar at St Patrick’s Cathedral, Dublin, and also worked at the National Concert Hall. His first curacy was in the parish of St Paul, Glenageary in Dublin (2010 to 2012). 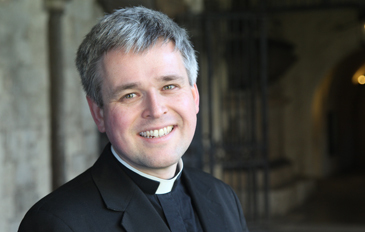 From 2012 to 2015 he was Minor Canon and Precentor at St Albans Cathedral, St Albans in England, and from 2015 until February this year he was Minor Canon and Sacrist at Westminster Abbey. Since then he has been working with the Salvation Army as Events and Marketing Manager at Oxford Street in London. He now wishes to return to parochial ministry, and to Ireland, and will take up this, his first incumbency, early in 2018. As well as music, reading, current affairs and travel, Paul is an avid Northern Ireland football supporter, and a season ticket holder at Leyton Orient. Perhaps Cork City FC will have a new fan! This entry was posted in Announcements, Appointments, Clergy, Diocese. Bookmark the permalink.